When you donate your item to ReStore, you are helping to make safe and decent housing possible for everyone. 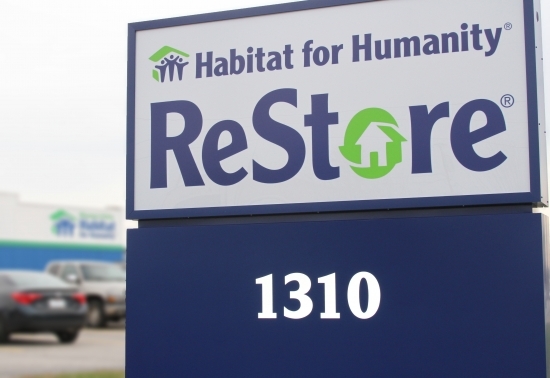 All profits from ReStore are used to support our Homeownership Program and our Home Repair Ministry. And by donating to ReStore, you are also kinder to the environment. For every $1 in ReStore sales, 1.6 lbs. of waste materials is kept from a landfill. Bring your donation to our ReStore (1310 Conant Street, Maumee, OH 43537) Tuesday-Saturday from 10:30 am to 5:30 pm. For large drop offs, pull up to the gate, located to the right of our building, and ring the call button. Our volunteers will be available to assist you with unloading your donations. Warehouse 2 (kitchen/bathroom cabinets, doors, windows, sinks and toilets) closes at 5:30 pm. Pickups and donations must be completed by 5:30 pm. We also offer a free pick-up service for large donations such as furniture, appliances, and building materials. To schedule a pick-up, or for questions about your specific donation, call us or fill out our online form. Headboards, Footboards, Futons and other Bedroom Furniture (end tables, dressers) accepted. Due to federal regulations regarding the resale of blinds, they must be in original packaging. Kitchen Cabinets, Bath Vanities & Medicine Cabinets accepted. Items must be clean and complete with doors and drawers. Must be 50 sq. ft. or more, new, free of stains & odors, and rolled, boxed or bundled for pick-up. Chairs, Chaises, Couch, Futons, Loveseats, Ottomans, Recliners and Sleeper Sofas accepted. Must be free of rips, tears, stains, odors & pet hair. Must be 48" or smaller and made of solid wood. Must be in good condition with no major scratches. Garage Doors must have all parts and be in working condition. Interior and Exterior Doors are accepted (pick up provided only if we are picking up other items). Siding Glass Patio Door must be vinyl clad. Lamps must be in working condition. Lights (chandelier, indoor and outdoor) must be in working condition. Supplies (outlet and switch covers, wiring, switches, outlets, junction boxes, etc. ), please have bagged or boxed. Area Rugs must be free of stains & odors and rolled. Carpet & Carpet Padding must be 50 sq. ft. or more, new, free of stains & odors, and rolled. Ceramic Tile if you are donating a minimum of 1 box. Hardwood Flooring if you are donating a minimum of 1 box. Vinyl Tile if you are donating a minimum of 1 box. Air Conditioners and Furnaces must be in good working order. Must be in original package. Milled Lumber must be 4-16 ft. long. Plywood must be 1/4 to full sheets (no scraps). Trim (Base & Case) must be 4-16 ft. long. Lengths must be between 4 and 16 ft. long. Consider donating baby furniture Epworth Furniture Ministry or Goodwill or contact organizations which support lower-income mothers like Mom's House. Books may be donated to your local library. Records could be worth something at Culture Clash Records or Allied Record Exchange. And they may be donated to Goodwill or Savers. Children's DVDs and VCR tapes may be worth something at Once Upon A Child. To donate a dishwasher, it must be manufactured in 2012 or later. Dishwashers manufactured earlier than 2012 can be recycled at OmniSource. Consider donating equipment through Fitness 4 Charity. Home Depot and Lowe's accept compact fluorescent bulbs. They do not accept long tube fluorescent light bulbs. Tube fluorescent light bulbs should not be placed in the trash and must be disposed of through an environmental recycling service for a fee. One option is Heritage Environmental Services. Because we don't want them either! Goodwill accepts computer equipment for use in their technical training program. Best Buy accepts monitors for recycling for a few of $25/monitor. Cubicles and Desks over 48" are not accepted. Contact other furniture donation centers (Goodwill, Epworth Furniture Ministry) for their donation requirements. Best Buy will recycle your television for $25. Your items may be worth something at Once Upon A Child.